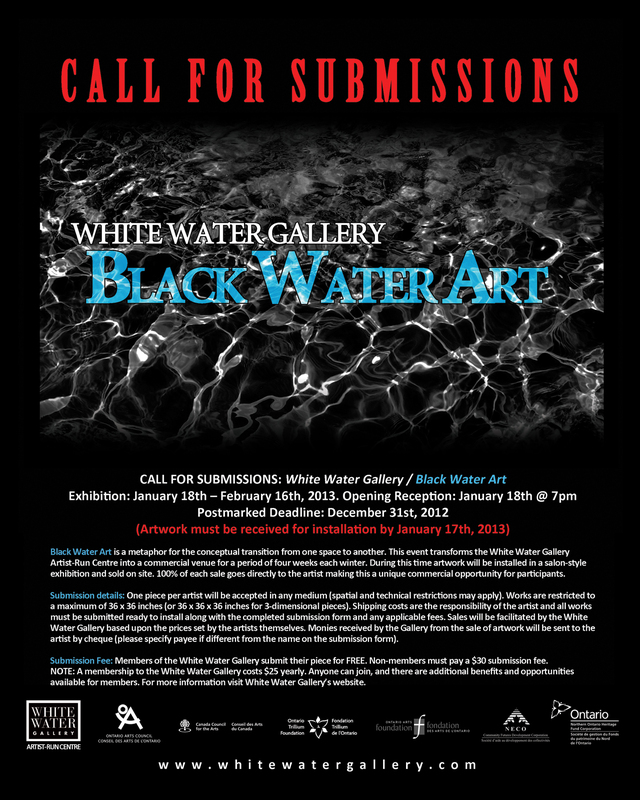 The White Water Gallery is still accepting work for their annual Black Water Art exhibition. Gallery hours are open from 11am – 4:30pm Tuesday- Friday each day for dropping off your work. Black Water Art is a metaphor for the conceptual transition from one space to another. This event transforms the White Water Gallery Artist-Run Centre into a commercial venue for a short exhibition each year. During this time artwork will be installed in a salon style exhibition and sold on site. 100% of each sale goes directly to the artist making this a unique commercial opportunity for participants. One piece per artist will be accepted in any medium (spatial and technical restrictions may apply). Works are restricted to a maximum of 36 x 36 inches (or 36 x 36 x 36 inches for 3-dimensional pieces). Shipping costs are the responsibility of the artist and all works must be submitted ready to install along with the completed submission form and any applicable fees. Sales will be facilitated by the White Water Gallery based upon the prices set by the artists themselves. Monies received by the Gallery from the sale of artwork will be sent to the artist by cheque (please specify payee if different from the name on the submission form).